In the previos node, you figured out Bayes Theorem and used it to calculate the probability of your coin being weighted knowing that it landed on heads. You did this by looking at the fraction of heads probabilities which came from weighted coins. We will now look at this formula more closely. Probability coin is Weighted given it landed on Heads. over the total Probability coin will land on Heads.. 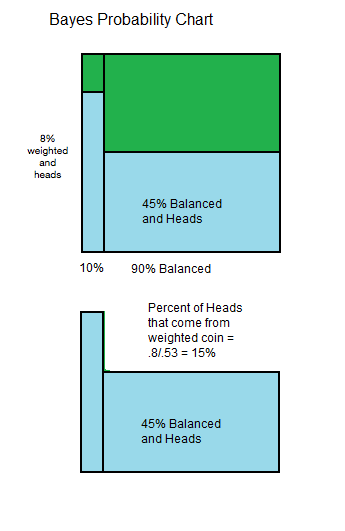 The prior Probability of landing on Heads is the combined Probability of getting Heads from a Weighted coin and a non-weighted coin.